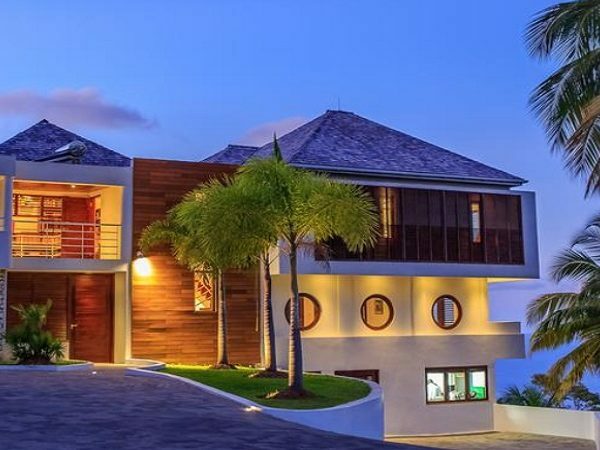 Why rent luxury villas in Saint Ann? Imagine a largely undeveloped fishing town on the shores of the Caribbean Sea. This town is positioned in northern Jamaica, and it’s home to sandy beaches that stretch along the coast for miles. The light tan to white sand is soft under the feet of locals as they head for the water to fish and enjoy the views of cliffs climbing in the distance. As the tide comes in, the clear blue water washes over the sand, revealing seashells of every color and size imaginable. Click here to request our lowest rates! While this sleepy town started out quiet and picturesque, it quickly became a dream destination for travelers around the world. As cruise ships pulled up to the port, luxury hotels and resorts began construction, and nightclubs opened their doors, the town filled with life. It started to share its natural beauty with the rest of the world, turning the parish of Saint Ann into one of the modern world’s most desirable vacation hot spots. The town we’re talking about is Ocho Rios. Located within the parish of Saint Ann, it’s positioned less than a 10-minute drive from Dunn’s River Falls. Other attractions in the city include jumping in the Island Gully Falls, swimming with the dolphins at Dolphins Cove, and explorations of the White River or Mystic Mountain. From snorkeling to horseback riding through the mountains, there’s no room for boredom when you’re in this sparkling city on the Caribbean Sea. 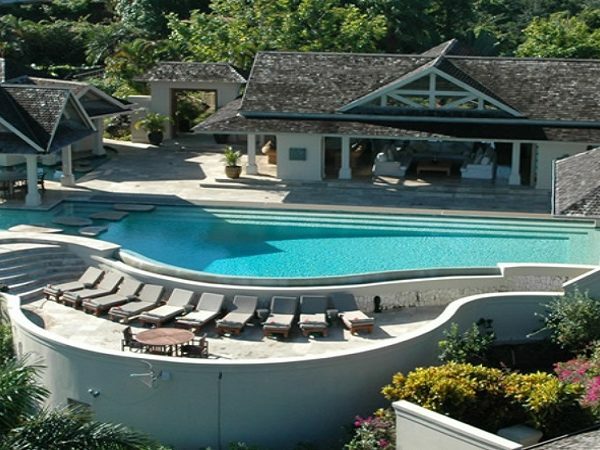 Ocho Rios is home to a variety of hotels, but the secret to an enjoyable visit is the private villas. These accommodations allow you to enjoy all the luxury of an expensive resort with the exclusivity and privacy that you need to thoroughly relax. When you book your trip with us, you can also enjoy an added 5% discount, making your trip more affordable as well as relaxing and enjoyable. Whether you’re traveling with someone special for a romantic vacation, you’re heading out for a family vacation, or you’re slipping away alone to regain your perspective on life, the following villa has everything that you need to make the most of Ocho Rios. This five-bedroom villa is located just west of Ocho Rios on Saint Ann’s Bay, but the extraordinary design details will make you feel like you’ve traveled around the world in one vacation. From the floor tiles and the chandelier to the tables and lamps, materials of the highest quality were sourced from Italy, Germany, and other countries with exquisite taste. Balinese Room: King bamboo bed with adjoining bathroom. The bath includes a sunken Whirlpool tub surrounded by marble and covered with delicate latticework. Double sinks and a large shower are also included, making this the perfect room for a couple. Mahogany Room: Four-poster bed and in-room Whirlpool tub. The private terrace leading out to the pool with incredible ocean views makes this room stand out from the rest. Peacock Room: King-sized bed with strong wrought-iron frame. A private terrace leading out to the pool and in-room Whirlpool tub ensure good times for couples, singles, teenagers, or colleagues. Ceylon Room: King Ralph Lauren bed with a walk-in shower. The shower is in the room, making this the perfect accommodation for one person hoping to spend some time alone. River Room: This is where you send the kids to play video games or jump into the bunk beds for a nap. Teenagers love this villa because they can go straight from their room to the beach or the gym. While each bedroom has unique qualities, they’re all decked out when it comes to electronics. Each room is equipped with an iPod dock and controls for the villa’s sound system. Televisions are available upon request, and you’ll have your pick of movies and music files to set the mood for any occasion. When you’re ready to pamper yourself, head down the river to the spa. All services are included in the cost of accommodations, so you can enjoy a sunset massage or an anti-aging treatment without blowing your vacation budget. The villa includes security, and they provide the equipment for many water sports that will add some excitement into your vacation. Steeped in history and well known as a more private, less developed version of Ocho Rios, Runaway Bay offers a more tranquil, scenic Jamaican experience. There are some hotels in the city and you’ll find some of the best restaurants here, but most people come for the secluded villas and the laid-back vibe of the town. From the sandy beaches to the hills extending in the horizon, this is the perfect place to be lazy and enjoy doing nothing for a change. Runaway Bay is positioned less than 20 miles west of Ocho Rios and approximately 20 miles east of Rio Bueno, so it’s easy to head down the shore for an evening excursion or day trip. While many villas offer direct access to private beaches, you can also go to many of the larger resorts and purchase a day pass for access to their private beaches. Swimming and lounging on the white or golden brown sand is a great way to pass your time, but you may also want to venture out into deeper water for a diving or snorkeling experience. If you’re feeling adventurous, you may even strip down and enjoy the experience of a nudist beach. This villa includes a main house with four bedrooms and 4.5 bathrooms as well as a cottage with two private bedrooms and bathrooms. The cottage features a jacuzzi tub and kitchen, so it’s perfect for honeymooners or a couple celebrating a milestone anniversary. The variety of accommodation options also makes this villa perfect for a larger family or group of friends and colleagues traveling together. The main house features air conditioning and private balconies in each of the bedrooms. An infinity pool with fresh water provides stunning views of the ocean for private pool parties. The pool deck is perfect for entertaining or lounging by the water, but the over-water seaside sun deck is what vacations are all about. Plus, you won’t want to forget about the small beach that is just steps away from your door. It’s just big enough to provide the intimacy you need for a family or romantic getaway. This villa is a short drive from the Jewel Water Park, and all guests receive discounts when playing golf at the Jewel Resort. If you head out for a day trip, make sure to ask about the complimentary cell phone that will give you local cell service while you’re away. There are many other complementary items that you may need, including a crib or pack-n-play and a variety of equipment for snorkeling and other adventures out on the water. Resting in the shadows of the Dry Harbour Mountains is a small Saint Ann parish town known as Discovery Bay. This picturesque spot on the Caribbean coastline was once believed to be where Christopher Columbus pulled onto the sand and set off to discover the lands that we now call Jamaica. Experts have proven that this story is unlikely, but the city is still home to Columbus Park. This is an open-air museum that houses a variety of historical artifacts, and it’s one of the biggest tourist attractions in northern Jamaica. If you’re searching for a villa that gives you access to pure white sand and crystal blue waters, make sure to stay close to Puerto Seco Beach. This is the Discovery Bay beach that attracts many families due to the inclusion of a playground, and it has the soft, white sand that you see in many Jamaica vacation brochures. It also features some of the best views in town, so it’s worth at least one visit while you’re in Discovery Bay. This is the perfect villa for large groups, family vacations, or destination weddings and honeymoons. The property includes a main house and annex with direct access to a private beach that spans approximately 70 feet. Visitors also have access to a private swimming pool, multiple jacuzzi tubs, a hammock, and a veranda bar. With well-maintained grounds, there are many places to slip away from the group and spend quiet time alone. Master bedroom with king-sized bed, adjoining bathroom, jacuzzi tub, stone shower, double vanity, walk-in closet, and outdoor sitting area with pool terrace. Great room with pool and poker table, sound system, television, and pool terrace with jacuzzi tub. Two additional bedrooms with beautiful views, including one king-sized bed and two queen-sized beds. If you need to sweat away some stress, head to the fitness room. If you want a couple’s massage or need other spa services, reserve time at the nearby Spa Pavilion. You can also request special settings for your meals, including festive beach parties, romantic candlelight dinners, and large dinner parties under the stars. Are you ready to slip away to Jamaica? Saint Ann parish is the perfect place to go for spectacular views and a long list of entertainment options, and it all starts with reservations at one of these northern Jamaica villas. You can find some great discounts online for larger hotels and resorts in all of these fantastic towns, but you’ll get the pampering that you really deserve plus the best rates when you stay in a private villa and take advantage of our added 5% discount. If you need private transportation, recommendations for activities and tours, or any other specialized travel arrangements, our professionals can take care of the details for you in advance. Your job is to arrive in Jamaica and allow our staff to cater to your needs and desires. Isn’t that what a relaxing vacation is really all about? 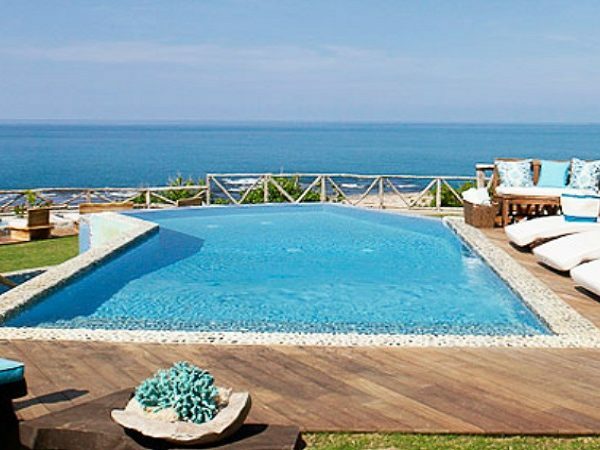 Request a FREE Quote Today on Luxury Villas in Saint Ann, Jamaica!